No software to install, nothing to download: it just works! Mailzinger addresses provide an essential buffer between you and the rest of the world. They're simple to create, easy to use and instantly redirect to your inbox. Your real email address is completely hidden, even when you reply. Sign up Watch more videos about our features. I can sign up for things online again! I avoided doing it for so long because no newsletter was worth the spam and, honestly, I can't risk being caught by a phishing scam. It's like Mailzinger gives your online freedom back. When you want a quote for insurance, a mortgage or real estate, use a Mailzinger. I'm telling you it will save you from their unending assault of emails after your 'free' quote. With 3 children in 3 different schools, it was impossible to find emails for their schedules. Now each school is identified with my child's name/school so mail always shows up with the name I recognize and can search on. Bliss! All mail comes to my main inbox - I can't mess up and send email from the wrong inbox anymore. Saves me lots of time checking and I know I won't accidentally reveal the email address I'm trying to keep private. I just wanted the peace of mind of greater confidentiality when using dating websites. I don't have to check another inbox and I never worry about revealing my real email address when I reply. Delivering mail at a scheduled time is brilliant; mail now arrives at a time I can grab a cup of coffee, take a bit of a break, and check my mail. We organize our small party planning business by giving each client/event a unique Mailzinger address. Much easier way to keep relevant event details from slipping through the cracks. I create a unique Mailzinger address for each networking event I attend so I can quickly identify where I've met someone. We create a separate Mailzinger address for each promotion we launch, letting us track what works best and how many new clients we attract. Really helps us focus our time to grow our business. Avoided selling on Craigslist or eBay because I was reluctant to give my real email address. When I saw Mailzinger it was the first thing I wanted to use it for. Our business email addresses correlate to our organization structure. We don't have an IT department to help us create new email addresses on our domain, but Mailzinger lets us create them whenever we need to. I love Mailzinger! I became a Premium user so I could have my own private @domain. Now I give unique Mailzinger address to everyone I deal with. Other people used to own my inbox - now I do! Our patent-pending Daily Schedule delivers your email when it's convenient for you. Identify spam and isolate hacked accounts to avoid inbox clutter. Don't rely on 'unsubscribe'. Create and personalise email aliases for all your online activity. Control who reaches you. See who's really sending an email. Don't be caught by fake 'from' addresses. Guard your email identity and keep your online activity private. Manage one inbox for all your Mailzinger addresses, not multiple inboxes. No tracking, no data gathering, no selling your data, no advertising. No kidding. 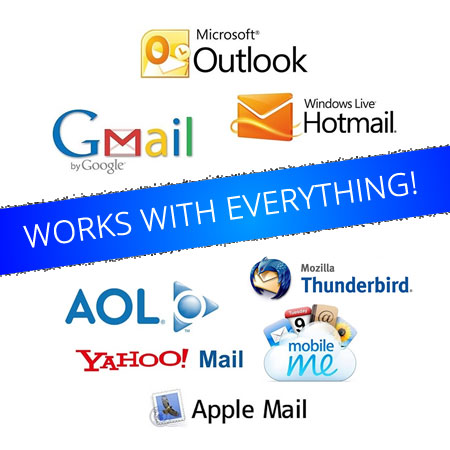 Mailzinger is a web-based application so it works anywhere there is a browser: on PCs, Mac, tablets and mobile phones. Most features of Mailzinger are free. If you want your own @domain, if you want to forward to more than one inbox or if you want more Mailzinger addresses, it's cheap to upgrade. Keep your email address and your online activity private. Break the chain in data gathering about your personal habits, preferences and associations. Guard your email identity, identify scams immediately and isolate hacked accounts. Mailzinger is the buffer between your personal email address and the world. Take back control of who can contact you and how they contact you. Stop spam and block unwanted contact instantly. No more relying on someone else's 'unsubscribe'.